Despite a huge gap in name recognition and fundraising, Republican Senate nominee Darryl Glenn is only trailing Bennet by 6 points in the survey released by Harper Polling. 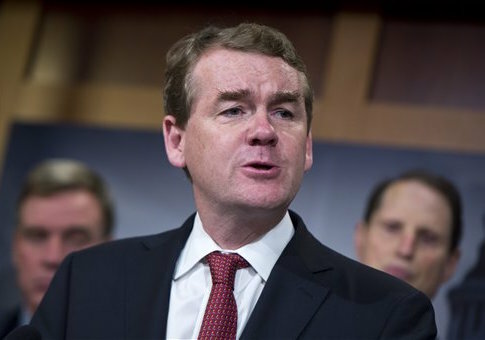 Bennet is ahead 46 to 40 percent, while only 38 percent said the Democrat has "performed his job as U.S. Senator well enough to deserve re-election." Respondents who described themselves as independent believe "it’s time to give a new person a chance" by a margin of 36 to 28 percent. Glenn, an Air Force veteran and El Paso county commissioner, has a net favorability rating of 24 to 14 percent but remains unknown to the majority of voters. Bennet’s lead is narrow considering his fundraising advantage. Bennet has $6.1 million cash on hand compared to just over $50,000 for Glenn. Harper Polling surveyed 500 general election likely voters between July 7 and July 9. The poll also showed Hillary Clinton with a 45 to 48 percent lead over Donald Trump, though Clinton’s unfavorable rating is higher than the presumptive Republican nominee at 57 percent. This entry was posted in Politics and tagged 2016 Election, Colorado, Darryl Glenn, Michael Bennet. Bookmark the permalink.